At Monji Optometry our selection of glasses can't be beat! Personal eyewear must fulfill two requirements to be ideal for you: it has to provide sharp vision and give you a great look! At Monji Optometry, we have a large collection of attractive, quality eyewear in our Burbank store. Our optical team will gladly guide you to the best pairs of frames to flatter your face and sharpen your eyesight. From sophisticated to funky, we have designer eyewear to embellish your unique style! If you’re in the market for new eyeglasses, we welcome you to browse through our selection. All materials and a rainbow of colors are displayed on our shelves. We offer affordable frames in stainless steel, plastic, titanium and other premium materials, from top European and American brands. We promote lenses and optics crafted by Essilor and Zeiss, leading international manufacturers of optical systems, and offer optional features such as anti-reflective coating. As the California sun shines strong, be sure to stop squinting and protect your eyes from damaging UV rays with a pair of sunglasses. Sunglasses, available in prescription and nonprescription, are also a trendy fashion accessory – no matter what you’re wearing. There are times when contact lenses are more convenient or preferable for vision correction. Playing sports is one of those times, as well as when you want to present your natural beauty with no eyeglasses over your face. Our eye doctors, Dr. Gary Monji and Dr. Judy Ichiuji will evaluate your eyes expertly to fit you with the best contact lenses for your visual requirements. Whether you need soft disposable lenses, extended wear lenses or bifocal contacts for presbyopia, we stock a wide range of brand-name contacts for your convenience. Fitting contacts well for hard-to-fit conditions is our speciality. We work extensively to enable our patients with keratoconus, astigmatism and dry eyes to wear contact lenses comfortably. Our Burbank office is fully equipped with many speciality contacts, such as SynergEyes Hybrid Contact Lenses, NovaKone for Keratoconus and scleral gas permeable contact lenses. If you’re interested in Ortho-k lenses to achieve vision correction without wearing eyeglasses or contacts during your waking hours, please contact us for an appointment! Did you suffer an eye injury and require ocular prosthetics? We are highly experienced in providing both medical eye care needs as well as aesthetic health care. You’re invited warmly to come to meet with our skilled optometrists for a consultation about prosthetic hand painted contact lenses. You’ll be awed by what we have to offer! look through our exceptional eyewear! We look forward to helping you see and look amazing! We have a wide variety of fashionable, quality eyeglass frames for both prescription eyeglasses and sunglasses. Beginning with expert contact lens fittings and visual testing in our Burbank optometry clinic, we’ll take you through the whole process of choosing the most appropriate contacts for your vision needs. A diverse selection of stylish sunglasses is available in our store, with prescription and nonprescription lenses. Sunglasses are the most efficient (and great-looking!) way to protect your eyes from damaging ultraviolet sun rays. Learn why eyeglasses are still the most popular option for vision correction, even with alternatives such as contact lenses and refractive surgery. Allow us to explain all about the different types of prescription lenses, such as bifocals, progressives, prescription sunglasses and high index lenses. We encourage you to meet with us in Burbank and tell us which hobbies and activities you favor. If you’re into hunting, playing racquetball, engaging in extreme sports or SCUBA diving, we have a pair of specialty eyeglasses to protect your eyes and enhance your performance! The most well-known photochromic lenses are manufactured by Transitions Optical, Inc. Optometrists around the globe recommend these advanced lenses that darken progressively in reaction to UV rays. We’re pleased to offer Transition Lenses at Monji Optometry. Enter our interactive site and answer questions about your lifestyle and visual requirements. Your responses will be used to narrow down our eyewear selection to the most appropriate eyeglasses for you. 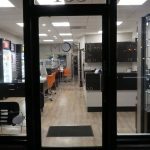 Before you step through the door of our Burbank store, your best eyewear options will be ready and waiting!